Prisoner of the Romans released by the procurator Pontius Pilate. The reason for his incarceration is given differently in various books of the New Testament. In Matt. xxvii. 16, he is called "a notable prisoner"; according to Mark xv. 7, and Luke xxiii. 19, he had been implicated in some insurrection and had committed what was known to the Romans as murder; John xviii. 40 represents him as a robber. According to the New Testament account there was a custom to release, at the request of the people on the day preceding the festival of Passover, one prisoner condemned to punishment. When they were given the choice between Barabbas and Jesus after the latter had been condemned, they selected Barabbas, possibly on the ground that he had been engaged in an insurrection against the Romans. Brandt, following Jerome on Matt. xxvii. 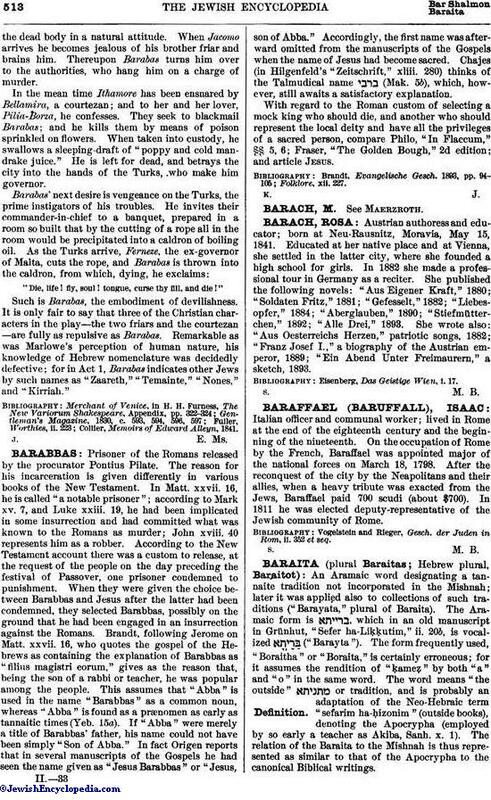 16, who quotes the gospel of the Hebrews as containing the explanation of Barabbas as "filius magistri eorum," gives as the reason that, being the son of a rabbi or teacher, he was popular among the people. This assumes that "Abba" is used in the name "Barabbas" as a common noun, whereas "Abba" is found as a prænomen as early as tannaitic times (Yeb. 15a). If "Abba" were merely a title of Barabbas' father, his name could not have been simply "Son of Abba." In fact Origen reports that in several manuscripts of the Gospels he had seen the name given as "Jesus Barabbas" or "Jesus, son of Abba." Accordingly, the first name was afterward omitted from the manuscripts of the Gospels when the name of Jesus had become sacred. Chajes (in Hilgenfeld's "Zeitschrift," xliii. 280) thinks of the Talmudical name (Mak. 5b), which, however, still awaits a satisfactory explanation. With regard to the Roman custom of selecting a mock king who should die, and another who should represent the local deity and have all the privileges of a sacred person, compare Philo, "In Flaccum," §§ 5, 6; Fraser, "The Golden Bough," 2d edition; and article Jesus.